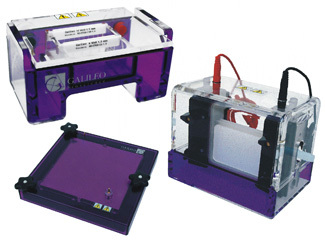 High Desert is proud to offer the complete line of Galileo electrophoresis systems. Galileo electrophoresis accessories, including trays combs and glass, also fit many other gel units from other manufactures. Looking for horizontal devices, vertical units or electro-blotting equipment? You will find all the features that you demand for usability, performance and reliability at High Desert Bioscience. These units are made from the highest quality materials by a dedicated team of employees. Design improvements insure long electrode life and extra-durable construction. Combine this quality with the comfort of a 3 year warranty and your decision is easy. Try High Desert liquid and dry-pac buffers for high performance and reliability, at a great price. Compare these electrophoresis units to those sold under other name brands.